Last night in Secaucus, MLB teams selected 75 players in the first two rounds of the amateur draft, starting with Vanderbilt shortstop Dansby Swanson (Diamondbacks) and ending with Texas A&M Tommy John surgery survivor A.J. Minter (Braves). For a few franchises, Monday was a potentially future-defining day: The Astros, armed with a $17.3 million draft budget because of their decision not to sign 2014 first overall pick Brady Aiken1 last season, had four of the first 46 picks, including an unprecedented two of the top five. The Rockies chose four players in the first 44; the Braves were the only team to pick five times. The Red Sox, White Sox, Padres, and Mets, meanwhile, had only one pick apiece, which (along with many millions of dollars, plus pain and suffering caused by Pablo Sandoval’s slash line) was part of the price they paid for free agents. We’ll be able to start answering those questions in just five or so short years! By then, the college draftees will be reaching their primes, and the most promising high school players will have made the majors. That’s the pulse-pounding pace of baseball’s player-development process, thrilling America with all the immediacy of a matchup between Boston and New York or a plate appearance against Joel Peralta. 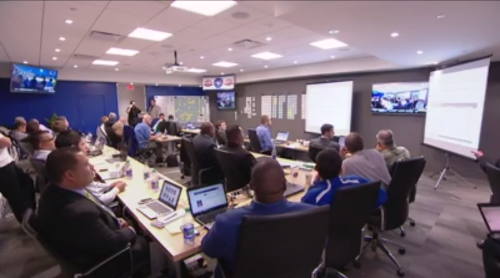 While it’s too soon to tell which picks will work out, we can critique the conference rooms from which those picks were relayed. Between offering jarring reminders of our mortality — David Cone fighting far-sightedness, Ken Griffey Jr. fighting the seams of his suit, Tommy Lasorda — the telecast treated us to live look-ins at many teams’ draft rooms, fleeting glimpses of corporate decor filled with flat screens, scouts wearing suits, and white boards covered with movable magnets (because smart boards cost more than a late-round senior sign). We don’t have to wait years for draft rooms to reach their ceiling; they’re all as ready right now as they’re going to get. So which teams flashed a plus-plus interior-decoration tool during Round 1? Let’s rank the rooms. The Cardinals have long been among baseball’s most adept drafters. Maybe their secret isn’t an innovative blend of stats and scouting, but drafting in the most somber surroundings. 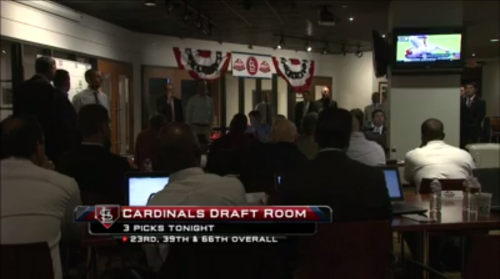 Between the low light and the on-screen footage of a writhing Matt Holliday, who painfully strained his quad during the draft, this room is a real downer. The Cardinals did draft a future outfielder, Nick Plummer, with their 23rd pick; unfortunately, Plummer is only 18, so St. Louis will need to find a more mature outfielder to take Holliday’s spot. 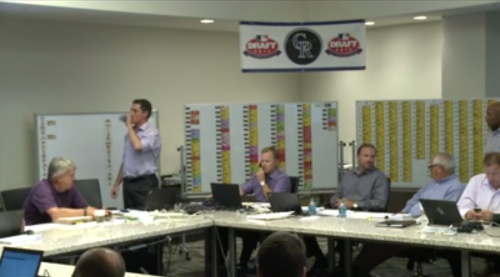 No glum gathering has ever needed a Coors Light party train to break through the wall as much as the Rockies’ draft room. Granted, we’re getting a limited look — WHAT ARE THEY TRYING TO HIDE? — but this is a bleak-looking corner, despite that intern’s artistic work with the magnets. This is a low-ceiling draft room — both literally and figuratively — that has already maxed out its physical potential. Maybe the muscular old man on the screen can help. Chicago’s draft room leads the majors in milling about, which might be because it also features the smallest TV. If you don’t have a good angle, you have to stand to see a screen. Only the A’s have fewer successful sacrifices than the Astros this season, but Houston’s draft room is one of the league leaders in bunting. It took years of strategic tanking for Houston to secure this second-overall pick, so we won’t begrudge them their luxurious, wide-open spaces and festive display. What Boston’s draft room lacks in windows and natural light, it makes up for with the most prominently placed snack table and well-rounded array of Tupperware. The Red Sox know that proper nutrition is essential to optimal performance, so they don’t draft on empty stomachs. The Diamondbacks try to portray themselves as a traditional organization with a one-foot-in approach to new-age analytics, but they spoiled their old-school cred by drafting in a sleek, futuristic room right out of a Starfleet bridge. Either this is the clubhouse at Salt River Fields, the D-Backs’ spring training facility in Scottsdale, or every office in Arizona has a scarlet “A” on the ceiling. The Blue Jays have one of the big leagues’ largest scouting departments, and their draft room is designed to handle the load. Just look at those clean lines and team colors, not to mention the efficient, front-facing layout, which allows everyone in the room to admire his own image on the screen. The luxury appointments aren’t anything special — with baseball’s biggest payroll, you’d think the Dodgers could afford to have at least a few fancy cigars or burning dollar bills in the frame — but this is the only draft room that can lay claim to Zack Greinke’s glorious man bun. 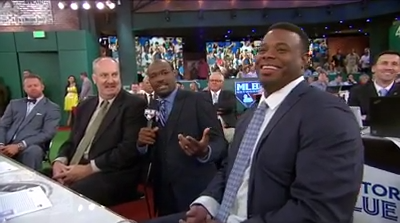 The teams with the truly tricked-out draft rooms — bottle service, water slides, and equations containing truths about baseball no one else knows — may have opted out of the broadcast, but of the ones we saw, this is the best. 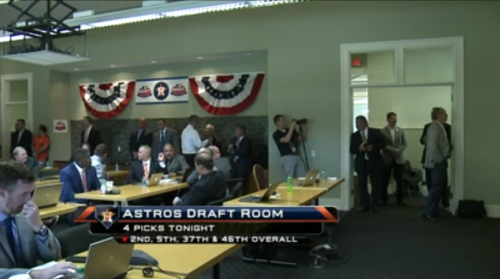 Like the legitimate Los Angeles team’s, Anaheim’s draft room combines Houston’s bunting and Boston’s snacks. Better yet, the place is packed with computers, and instead of asking their scouts and front-office types to wear uncomfortable clothing, the Angels told them to color-coordinate. 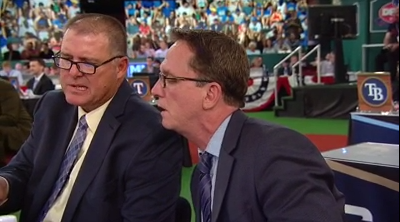 The team spirit is palpable, the mood so celebratory that you’d think they’d just redrafted Mike Trout. 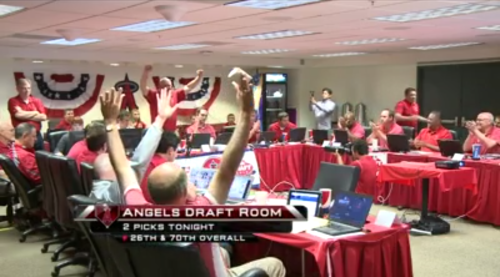 The Angels might have one of baseball’s worst farm systems, but they have the draft room down. Thanks to Effectively Wild listener Adam Prestin for inspiring this post. Also Cleveland’s 2015 17th overall pick. Other than the obvious answer: Any who departed from the most popular public ranking.